Conservative Party chairman, Sir Patrick McLoughlin, with Coun Peter Jackson. Northumberland Conservatives launched their manifesto last week as they bid to wrest control from Labour at County Hall in May. The party’s candidates and councillors were joined by Conservative Party chairman, Sir Patrick McLoughlin, at the launch on Friday afternoon. Sir Patrick said: “What is happening nationally will be a backdrop to the elections, but local issues will be key. 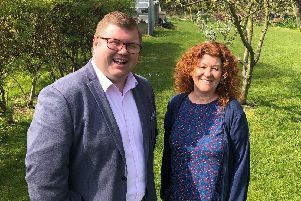 “The Northumberland Conservative group has put forward issues in the manifesto that are of great importance to the people of the county, for example, allocating extra funds to fix potholes. The manifesto features ‘seven pledges to save our county’ with the first being to stop the relocation of County Hall to Ashington. The Conservatives also say they will represent all areas of the county more fairly through the introduction of five local area councils and local area investment funds. There are also pledges to spend £100million repairing potholes, to scrap transport charges for post-16 students, to ‘halt the march of the developers’ and to prevent destruction of the environment.